WASHINGTON — Shouting ‘‘FBI, open the door,’’ authorities arrested Roger Stone, a confidant of President Trump, before dawn Friday in a criminal case that revealed that senior members of the Trump campaign sought to benefit from the release of hacked emails damaging to Hillary Clinton. The seven-count indictment against Stone, a self-proclaimed ‘‘dirty trickster’’ with a long history with Trump, is the first criminal case in months from special counsel Robert Mueller. Stone appeared at court in shackles later in the morning, did not enter a plea and was released on a $250,000 bond. Outside court, he raised his arms, formed ‘‘V'’ signs with his fingers and blasted the special counsel’s Russia probe as ‘‘politically motivated.’’ Stone vowed to fight the charges, saying he was ‘‘falsely accused’’ of making false statements to the House intelligence committee. He said any error he made in his testimony wasn’t intentional. The indictment provides the most detail to date about how Trump campaign associates in the summer of 2016 actively sought the disclosure of emails the U.S. says were hacked by Russia, then provided to the anti-secrecy website WikiLeaks. It alleges that unidentified senior Trump campaign officials contacted Stone to ask when stolen emails relating to Clinton might be disclosed. Prosecutors did not charge Stone with conspiring with WikiLeaks or with the Russian officers Mueller says hacked the emails. Instead it mirrors other Mueller cases in alleging cover-ups and deception, accusing Stone of lying to lawmakers about WikiLeaks, tampering with witnesses and obstructing a congressional probe into whether the Trump campaign coordinated with Russia to tip the election. Stone is charged in a seven-count indictment with witness tampering, obstruction, and false statements about his interactions related to the release of hacked emails during the 2016 election. Some of those false statements were made to the House intelligence committee, prosecutors allege. In referring to Trump campaign officials and their desire to leverage hacked emails, the case brings Mueller’s investigation into the president’s inner circle but it does not accuse the president of any wrongdoing or reveal whether he had advance knowledge of the WikiLeaks trove. CNN aired video of the raid at Stone’s Fort Lauderdale, Florida, home, showing agents in body armor using large weapons and night-vision equipment, running up to the home and banging on the door. ‘‘FBI open the door!’’ one shouts. ‘‘FBI, warrant!’’ Stone could then be seen in the doorway in his sleepwear before he was led away. Though not uncommon for the FBI to make early-morning arrests of targets under indictment, it’s the first time Mueller has used that tactic. Stone had been predicting his indictment for some time. Hours later, he appeared in court in a blue polo shirt and jeans. In releasing him on bond, a magistrate judge restricted Stone’s travel to South Florida, Washington and New York City and ordered him to avoid contact with witnesses. Stone is the sixth Trump aide or adviser charged by Mueller and the 34th person overall. The nearly two-year-old probe has exposed multiple contacts between Trump associates and Russia during the campaign and transition period and revealed efforts by several to conceal those communications. The case comes weeks after Trump’s former national security adviser, Michael Flynn , was castigated by a judge in open court and just hours before Paul Manafort , his ex-campaign chairman, appeared on allegations that he had lied to prosecutors. Well-known for his political antics and hard ball tactics, Stone has reveled in being a Washington wheeler-dealer dating back to the Nixon administration. He has also pushed several conspiracy theories and was an early and vocal supporter of Trump’s candidacy. Stone was one of Trump’s earliest political advisers, encouraging both his presidential runs. He briefly served on Trump’s campaign, but was pushed out amid infighting with then-campaign manager Corey Lewandowski. 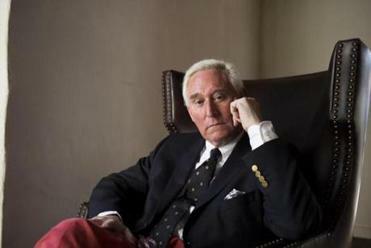 Stone continued occasionally communicating with Trump and stayed plugged into his circle of advisers, both formal and informal. The indictment says Stone repeatedly discussed WikiLeaks with campaign associates and lays out in detail Stone’s conversations about stolen Democratic emails posted in the weeks before Trump beat Clinton. Mueller’s office has said those emails, belonging to Clinton campaign chairman John Podesta, were hacked by Russian intelligence officers. The document says that by June and July 2016, Stone had told senior Trump campaign officials that he had information indicating that WikiLeaks had obtained documents that could be damaging to Clinton’s campaign. After the July 22, 2016, WikiLeaks release of hacked emails from the Democratic National Committee, the indictment says, a senior Trump campaign official ‘‘was directed’’ to contact Stone about additional releases and ‘‘what other damaging information’’ WikiLeaks had ‘‘regarding the Clinton campaign.’’ The indictment does not name the official or say who directed the outreach to Stone. Though no officials are identified by name, one Trump campaign aide cited in the case is Steve Bannon, who later became Trump’s chief White House strategist. Bannon, referred to as a ‘‘high-ranking Trump Campaign official,’’ exchanged emails with Stone in October 2016 about WikiLeaks’ plans. The indictment quotes from those emails, which had previously been made public by news outlets. While the indictment provides some new insight into the Trump campaign, it deals largely with what prosecutors say were Stone’s false statements about his conversations with conservative writer and conspiracy theorist, Jerome Corsi, and New York radio host, Randy Credico. The indictment accuses Stone of carrying out a ‘‘prolonged effort’’ to keep Credico from contradicting his testimony before the House intelligence committee. During that effort, prosecutors note that Stone repeatedly told Credico to ‘‘do a ‘Frank Pentangeli,'’’ a reference to a character in ‘‘The Godfather: Part II’’ who lies before Congress. Stone is also accused of threatening Credico, including through messages in which he called him ‘‘rat’’ and ‘‘stoolie’’ and accused him of backstabbing his friends. Stone also threatened to ‘‘take that dog away from you,’’ a reference to Credico’s dog, Bianca. ‘‘I am so ready. Let’s get it on. Prepare to die (expletive),’’ Stone also wrote to Credico. Stone has said for months he was prepared to be charged, though he has denied any wrongdoing. A grand jury had heard from witnesses connected to Stone. And the intelligence committee last year voted to release a transcript of Stone’s testimony to Mueller as a precursor to an indictment. But he has long attracted scrutiny, especially because of a 2016 tweet — ‘‘It will soon (be) Podesta’s time in the barrel — that appeared to presage knowledge that Podesta’s emails would soon be released. Stone has said he had no inside information about the contents of the emails or the timing of when they'd be released. Associated Press writers Michael Balsamo in Washington, Jennifer Kay in Miami, and Terry Spencer and Kelli Kennedy in Fort Lauderdale, Fla., contributed to this report.